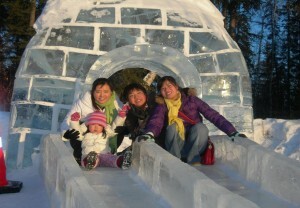 I still cannot forget the first Christmas our family experienced after resettling in America in 2007. I also have a memory from the days of living in hiding from Chinese public security agents in China after defecting from North Korea. Even in the small village in China I was living in, signs of “Merry Christmas” were plastered all over the streets along with pictures of Santa Claus. Then, people said, “Santa Claus will come down quietly at night to give us our presents…” Others said, “Santa Claus will come down the chimney quietly at dawn to give us lots of presents…” Each time we heard these stories, we too waited for Santa Claus. Also, in the evening, we saw many couples stroll across brightly lit streets as though in a daylight. They looked very happy, and we wondered when we would be able to laugh and enjoy ourselves as freely as they. This was the “Christmas” we had a glimpse of in China. Then, finally, I was able to enjoy this “Christmas” in Alaska, USA, as a free woman. “Ouch,” my nostrils were frozen with cold and damp air. December in Alaska was so cold, and it was hard to see infront of us because of the icy fog. As soon as we opened the entrance door, the cold air made it difficult for us to breathe. Snow piled on the evergreen trees, bending and breaking their branches. Cars, covered with snow, resembled small hills. Rabbits, deer, and moose scavenged underneath inches of snow in search for food. They blocked traffic even during the day. Moreover, in the winter, 23 hours out of 24 hours were pitch-dark night. If the cars were not charged, the engines froze, causing them to sit idle for days. Such snow and cold characterized the northernmost and coldest region of America! The Christmas that we experienced there was filled with moments of joy and wonder. Christmas was finally here. After placing potted plans with red leaves inside the church sanctuary and by the well-lit windows, we were busy decorating the Christmas tree with colorful lights and bells. Time flew as we shared the joy of “Christmas,” grateful for the amazing grace that God has shown by coming down to this world to atone for our sins. When it was time for farewell, there were some people who were in tears, grateful for God’s presence with them. The next day, after hearing the sermon of the pastor, I learnt the real meaning behind Christmas for the first time—the day baby Jesus came down to the Earth to save us from our sins. Blessed with feelings of gratitude and eating well-prepared delicious food, I fully enjoyed “Christmas.” Even in the midst of severe cold of Alaska, our first Christmas in America was one full of joy and fun that our family could never forget. Christmas was more special to me, a North Korean defector, because of my memories of the birthdays of Kim Il-Sung and Kim Jung-Il. Different from their birthdays when I lifted up 2.2 lbs of candy and snacks that the Josun Workers’ Party distributed and said, “Thank you, Supreme Leader,” the birthday of Jesus was a day when I could experience joy and freedom of both the body and spirit. Our parents, brothers, and sisters who are still in North Korea do not know the freedom and “inalienable rights” that we take for granted now. Nor do they know that “Christmas” is a special day to everyone and a privilege and blessing that surpass anyone’s imagination. I wait for this year’s Christmas with a hope that someday the meaning behind “Christmas” is known all across North Korea, and my brothers and sisters there may enjoy the freedom and peace that I am enjoying right now. Jesus, the Prince of peace! Merry Christmas, and please remember to pray for North Korea!